Russia has paid some of the external and internal debts that were bequeathed to it by the collapse of the Soviet Union, but the total figure runs into trillions of roubles. 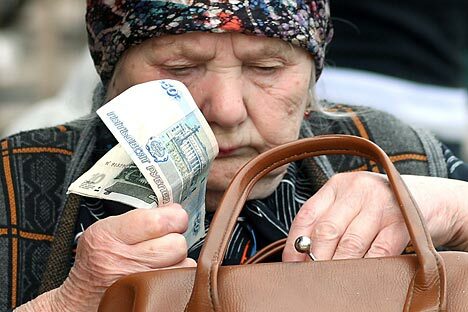 Russia's Finance Ministry has submitted a new proposal to the government that would slash the compensation payments promised to Soviet savers who saw their deposits wiped out in the 1990s, according to a report in Kommersant newspaper Wednesday. The proposed changes would overturn a law passed in 1995 by then-president Boris Yeltsin that committed the Russian state to a program of issuing new government bonds in compensation for lost deposits. Russia has paid some of the external and internal debts that were bequeathed to it by the collapse of the Soviet Union, but the total figure, which runs into trillions of roubles, is widely acknowledged to be too large to ever be returned. The bulk of the money affected by the Finance Ministry’s proposal was originally placed in former national savings bank Sberbank (315 billion Soviet roubles), and former state insurance agency Rossgosstrakh (about 29 billion roubles), according to Kommersant. To qualify under the 1995 law, savers’ cash must have been deposited before October 20, 1991; the moment the radical market reforms were announced that triggered hyperinflation and wiped out the savings of millions of Russians. But if payouts were to be made today at the level promised by Yeltsin in 1995 it would cause a financial “catastrophe,” according to the Finance Ministry, and require a six-fold increase in state debt to 29.6 trillion roubles ($900 billion), Kommersant reported. Instead, the Ministry is proposing to use a lower coefficient for calculating the size of payouts (four modern roubles for one Soviet rouble rather than 85 modern roubles for one Soviet rouble), and abolish the open-ended commitment made by Yeltsin, finishing all payments by 2020, according to the newspaper. Under the proposed scheme, the Finance Ministry will pay out 340 billion roubles ($10.3 billion) until 2020, an expenditure that is already priced into the government’s budget calculations, Kommersant reported. All other government ministries have agreed with proposal, Kommersant said, apart from the Economic Development Ministry, which argued the payouts under the plan were too low. “We see the news as marginally positive, as it will effectively close this long-lasting issue with vintage USSR debt,” analysts from Bank of America Merrill Lynch in Moscow said in a research note Wednesday. Unlike other ex-Soviet states that only compensated their citizens for a fraction of what they lost during the turmoil of the end of the Soviet Union, Russia pledged to pay back everything. The government estimated in 2012 that the public are still owed some 25 trillion roubles ($785 billion) in lost Soviet savings, Bloomberg reported. Last July, the European Court of Human Rights ordered the Kremlin to pay compensation to Russian pensioner Yury Lobanov for government bonds he bought in 1982.